Bonding with your dog is incredibly special. It delivers emotionally through the deep friendship that is formed. Also physically, through the simple benefits of sharing time together, from a cuddle on the sofa to enjoying a long dog walk. Many of us consider our dogs as a family members and an essential part of our lives. Assistance Dogs are, as far as we’re concerned, four-legged superstars that add another dimension to the human-dog bond. They have the power to change the life of a human on a practical level as well as emotionally and physically. They do this through the task work and skills they learn during their time with us at Dogs for Good. The skills they learn enable their owners with physical disabilities, autism and dementia to go on and live a more independent and enriched life. 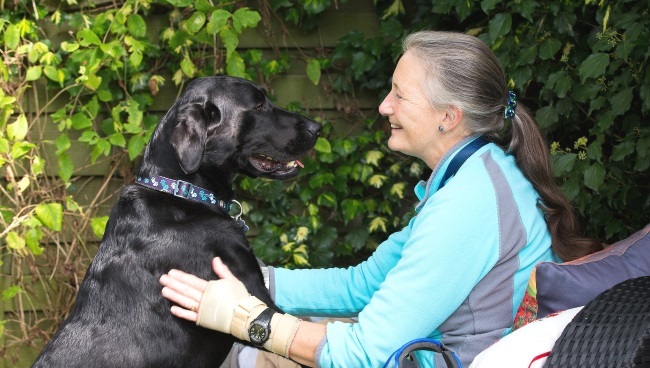 Ann, who has assistance dog Twickers, sums things up nicely: “I’d loved my pet dogs in the past but the bond you get with these dogs is something else,” she says. Read their story. With many pet dog relationships, the human-dog bond starts right from puppyhood, in which case any prospective responsible dog owner has done their research into the right dog for them and their families. Once the puppy arrives there is all the nurturing, training and socialising that goes with caring for a new pup that helps to establish the bond you have with your dog. Anyone that’s taken on an older dog or rescue dog will understand that while a dog may already have learnt basic commands or come fully house trained, in the early days there is still a lot of effort required to build a trusting and supportive relationship between you and your dog. How do we help our assistance dog partnerships achieve that special bond? Of course, we don’t match any dog with any owner, press ‘go’ and expect to sit back and watch the magic happen. The human-dog bond must first be established for the partnership to flourish and thrive. Our assistance dogs will go to their owners as adult dogs aged around two years old. So, they put their trust in us to find exactly the right four-legged match for them – something we take very seriously and something we’re really good at. Our trainers and instructors meet regularly to discuss people that are waiting and the dogs that we have coming through training. They determine whether there are any ‘matches’ that can, in their opinion, be progressed. This is a really important part of the process with many factors to consider; for example, there’s no point us matching a bouncy, fun-loving dog to a person that prefers to live a quiet life, because neither will be happy and the partnership won’t flourish. Sometimes our assistance dog owners have never had a dog before, so it’s our responsibility to provide that person with a good education and the right training to enable them to understand and interpret their dogs’ needs and make the right decisions and choices for their dog’s welfare. By doing things this way, we create better partnerships which are more fulfilling for both the person and the dog, and this leads to better outcomes in all of our services. Once a dog and person are successfully matched, the first few weeks of training is all about helping the partnership to establish that important bond. Our instructors spend time every day with the new partnership empowering the new owner to tap into all the training that their clever dog has learned – and wants to show off! Over time, as the bond starts to deepen and confidence starts to build, our instructors bring down the frequency of their visits. Even then, every assistance dog owner is always able to call us if they have any problems or questions. Our welfare team carry out a home visit once a year to ensure everyone is happy and healthy. 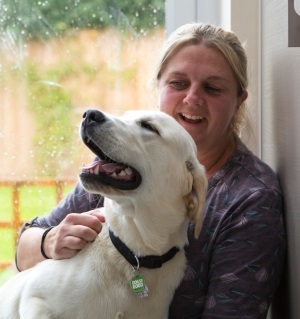 Dogs for Good – Meet Mary and assistance dog Yan from Dogs for Good on Vimeo. Once experienced, the power of the human-dog bond never leaves you. The bedrock that underpins it all is understanding that this special relationship works both ways; with respect, care, trust and love at the top of the list of essential requirements. We reply on the invaluable support of donors and sponsors to fund dogs like Yan and any contribution, however small, makes a huge difference. Support our work.